The Ocean Ranger was, in its day, the largest Mobile Offshore Drilling Unit in the world. One toolpusher called the rig "unsinkable" (note to anyone offshore- if it floats, it can sink). The loss of the Ocean Ranger was one of the biggest disasters in the history of the oil industry. The Ocean Ranger, owned by ODECO out of New Orleans, was under contract by a Mobil subsidiary off the coast of Newfoundland. A ferocious storm came up. After bracing for the storm, the men aboard thought they were safe, but a rogue wave smashed a porthole and flooded the ballast control panel. Between an under-trained crew and a serious design defect, the platform capsized in heavy seas that it should have been able to handle. Some of the crew was washed into the water. Some got into lifeboats that were ripped to shreds as they were lowered. One boat, however, with approximately 20 souls made it down safely. A crewboat on standby at a nearby rig made a heroic effort to save the men in the water, but the frigid waters incapacitated the men in the water in seconds. ODECO deemed it too expensive to equip the rig with survival suits. The men on the crewboat, despite their best efforts, had neither the equipment or the training to rescue unconscious men from the heavy seas. The one intact lifeboat was found by the M/V Seaforth Highlander. The crewboat lashed lines from the lifeboat and the men on board were just a couple of feet from safety, however the lifeboat depended on the men on board staying strapped into their seats for ballast. The lifeboat slowly capsized. All the men were washed into the water. The captain of the Seaforth Highlander described it as "watching a slow motion movie." All the men in the lifeboat were quickly overcome by hypothermia and drowned. Every single crewman aboard the Ocean Ranger died. Only couple of dozen bodies were ever recovered, despite extensive search efforts. The USCG Board of Inquiry [PDF] describes the incident in much, much more detail. I highly recommend it. * Insufficient training. Ballast Control crewmen only had basic, on the job training. They had no classroom training and didn't understand the working principals of the pumps. The ballast system also went into a "safe" mode in case of failure whereby all ballast compartments are sealed. It appears that the crew misunderstood a bypass system and unintentionally worsened flooding. * The crew of the Ocean Ranger didn't call for help until it was deep into the storm. Once they did abandon ship, the Ocean Ranger actually stayed afloat for at least another hour. The crew died while the rig was still afloat. * There was a critical design flaw that was completely missed by the designers and regulatory bodies: the chain lockers, storing the anchor chain, were open to the sea and un-sounded. The crew had no way of knowing if the chain lockers, an enormous void that could cause the rig to list or capsize if filled, had water in them. They had a 5' hole at the top for the chain to enter that had no way of closing off or sealing from the weather. Inviting Disaster (thanks for the rec, PE) has a chapter on the Ocean Ranger. It closes with one interesting observation. The Ocean Ranger had drilled in the Baltimore Canyon off the East Coast. It drilled off the coast of Ireland. It drilled offshore Alaska. It had just begun drilling off Newfoundland. The largest, most advanced drilling rig of its day never once struck oil. * Here's an archive of Canadian news broadcasts about the sinking. * Ocean Ranger had a sister ship. It was originally named Ocean Ranger II, but was renamed Ocean Odyssey while still in the shipyard. It suffered a well blowout that ended its oil drilling days. It now serves as a satellite launch platform as a part of the Sea Launch system. It's still operational, despite one rocket that blew up on launch. "Oil that is, black gold, Texas tea." Ghanem 'is gone' - Upstreamonline - Head of Libyan NOC gone. He tended to be very pro-IOC, so we'll see what happens. Under his tenure, there was extensive Exploration & Production by Western firms. BP and Total especially. Related: (?) Lockerbie bomber 'set free for oil' - Times Online It's no secret oil and geopolitics are regular bedfellows. Large British oil trading company buys sour crude, strips out H2S, dumps H2S contaminated slop in Africa. Burgan, fabled Kuwait oil field in irreversible decline with high wa - GLG News\ Also by Lynch. Carbon Capture and Sequestration being analyzed for depleted fields in PA. We'll see how CCS works out. I think there will be some highly successful projects, but we'll have to see how large it can scale up. Burgan going to IOC's? Kuwait must really be desperate if they are thinking about handing over their crown jewel. The thing is, there's not that much the IOC's can do that Schlumberger can't. For example, when Exxon bought Mobil, they shut down a very large R&D department, so I just don't know if the IOC's have that much to give. $31.5 Billion in new taxes as a part of a push to end the US government's role as nurturer to the oil industry. John Malcolm Blair wrote an excellent history of the tax breaks the industry has gotten (imagine $1 million dollars in tax writeoffs for a $100,000 drilling investment, thanks to the Oil Depletion Allowance) that was heavily cited in The Prize. The end of fossil fuel subsidies. Obama points out lots of subsidies (Royalty relief, for one), despite the oil industry being well established. I don't think it will make much of difference, as long as oil doesn't dip below $40-$50 / barrel for long (say, 6 months). 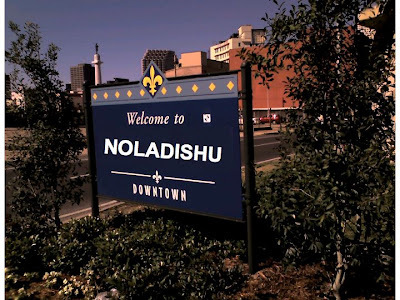 If it stays at $30 for a year, South Louisiana economy (especially Morgan City, which has one of the lowest unemployment rates in the US) will crater and burn. Long term, a $5 swing in the price of oil has more effect on activity than US subsidies. Lots of money from Obama for Wind. How come River Turbines got left out? Canadian Oil Sands Pipeline (which was later approved, but I forgot to bookmark that news article) was under a lot of scrutiny from some environmentalists due to Synthetic Oil's larger carbon footprint. 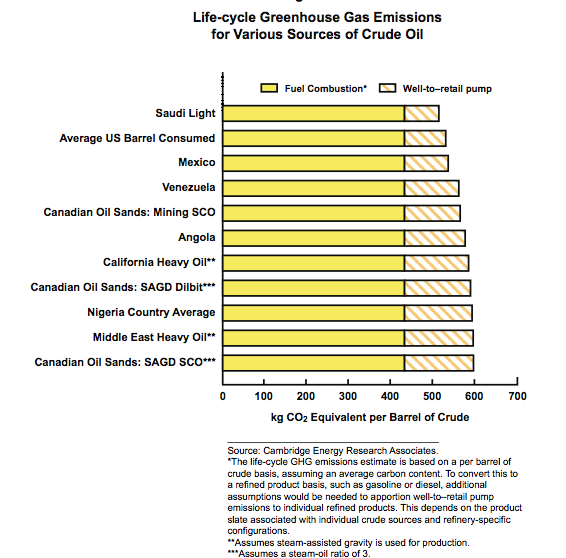 Producing 1 barrel of oil sands synthetic crude is at least 10% more carbon-intensive than light, sweet crude imported from overseas. Reservoirs that cross country lines need special agreements Unlike Norway and the U.K., the US and Mexico haven't worked out border agreements, which could delay production or cause US-situated platforms to siphon off Mexican oil. UPDATE: More links to add. Help! They Can't Find Any More Oil! International oil and gas companies increased exploration spending by 21% in 2008 to $492 billion, but worldwide oil and gas reserves were .4% lower by year end. There was a 4.4 billion barrel decline in oil reserves. This isn't a singular event, either. Over the past three years reserves have been flat. Related: FT.com | FT Energy Source | Finding new oil gets ever more expensive ...One significant finding of the study: in the US, reserve replacement costs more than doubled [in a single year]. An illustration of gyroscopic stabilization. Secrets of the Gun that Shelled Paris. From an old issue of Popular Mechanics. Don't you wish newspapers and magazines covered science like this today? RNA produced from "Primordial Soup". Wow. Maybe we can get some of that evolution around here: Too evolved for US audiences? Costly [British] libel suits are stifling science. Perhaps the starkest indication that parliament needs to examine our libel laws is that American legislators are acting to block them. They recognize that free speech in America is compromised because US journalists have been dragged into an English libel court (so-called “libel tourism”) and forced to back down because of the high costs involved. Congress is considering a bill, which has already been passed by the state of New York, that would make English judgments on libel unenforceable in America. Fined: for not producing enough garbage. Bike Mechanic Too Efficient. A standard monitoring tactic was used, but with no appeal process, there's an automatic fine for "green" mechanic. "Catch more flies with honey than vinegar?" - Not so much: To get rid of fruit flies, which are so plentiful this time of year, fill a small dish with about a half a cup of cider vinegar, and add a drop of dishwashing liquid. The cider vinegar gives [off] fumes similar to spoiling fruit, which attracts the flies, while the dishsoap breaks the surface tension. Flies land, flies drown, no more flies! It works like a freakin’ charm, it does. Plus, there’s a morbid sense of satisfaction, seeing how many you can catch in a single day. Synthetic Humans? On average, one-half of the nitrogen in a human body is synthetic, the product of one of a Haber-Bosch plant. First ships navigate Northeast passage. 2 German merchant ships, escorted by Russian icebreakers, are navigating Europe-Asia shortcut. 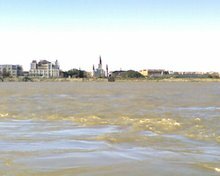 Could it be the first time in 5,000+ years the channel is regularly ice-free? "Nondislocated Fracture of the Distal Fibula"
I made it to 25 years old before I had my first broken bone. 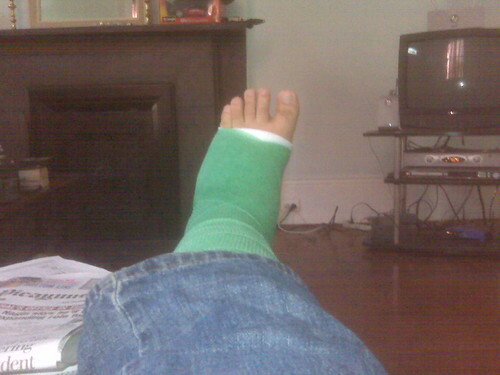 We were planning on going to Herbsaint tonight and we're going anyway, broken ankle be damned. UPDATE- Went to Herbsaint. Had a hell of a meal. We did the French tasting menu. It consisted of a salt cod/potato/frisee/lobster dish that was fantastic. The Trout Almondine was completely different from any other dish I've ever had in New Orleans. Instead of the traditional Creole Almondine, with its heavy, creamy sauce, this was very light. It almost wasn't there and it added a lot to the dish. The Ratatouille was good, but I like my version a little better. The point of the tasting menu was to do the dishes like they do in the South of France. I love stinky cheeses, but the blue cheese that was selected was too much for me. It tasted like gym sock. Desert more than made up for it, though. It was a "Breton Butter Cake" (think about a croissant, covered in even more butter, turned into a cake). Delicious. Staff was also pretty cool about the crutches and all. Great service. Great sazerac, as usual. Harry Shearer interviewed Maria Garzino, the whistle-blower who first pointed out how flawed the M.W.I. pumps were. I listened to the show and took notes and just wanted to share a few random observations. You can listen to the interview for yourself here (Sunday Sept. 13th Show). Ms. Garzino did give a few conflicting statements over the course of the interview, but not an unreasonable amount, given it was a 30 minute interview on a technical subject. * An error on the ACOE pump support structure drawings caused the pumps to be installed with 2' less of NPSH(a) than the pump impellers were trimmed to. Ms. Garzino thought it was not an unusual error, given the complexities of the project. It took a while to correct, but it eventually was fixed. * The "battle test" that the ACOE is so proud of for the M.W.I. wasn't much of test at all. SCADA data shows that the M.W.I. pumps were only run once the heavy lifting was done by the direct drive pumps. For background, all major industrial equipment is controlled by Programmable Logic Controllers (PLC's). These primitive, reliable computers communicate to each other through several different protocols, one of which is SCADA. It's still a little hard to get definitive evidence, but it seems to be backed up by the runtime reports at the back of the Parsons Report (Table 3-10, etc.). * One of the serious design flaws that kept the M.W.I. pumps from being successfully tested was air getting into the hydraulic pumps. In the M.W.I., diesel engines turn a hydraulic pump. That hydraulic pump pressurizes fluid that runs through lines to a hydraulic motor. The motor turns the impeller blades that moves the water. The reservoir that fed the hydraulic pumps was mounted incorrectly, causing air to carry into the hydraulic pump. Air in a hydraulic pump bad, on a good/bad scale. It tore the guts out of the hydraulic pumps. The reservoirs were mounted higher, to avoid air undercarry. That solved that particular problem. * Maria Garzino then described the various stages of whistle-blowing she went through. She brought it up with various folks within the Corps. After she exhausted internal appeals, there was an Internal Technical Investigation by the Corps. I believe that was done by the Vicksburg office. She said the report was nice and all, but it didn't set its own scope and didn't really address her concerns. The Parsons Report followed on with more or less the same issues. Finally, the Office of Special Council hired their own technical advisers, went through all the reports and basically agreed with her over the Corps. Here's a letter [PDF] that describes a little more about the OSC report. * Another issue she went through is how her actions changed some of the Corps plans. The Corps was, at one point, planning on re-using the M.W.I. pumps in the permanent pump stations. Later, the Corps decided that the M.W.I. pumps were only temporary. I don't know if there's any way of knowing whether the Corps had the original intent of using the Corps for the permanent stations, but I can say that they got lots of pushback from all sorts of sources when they discussed re-using the M.W.I. pumps. Mrs. Garzino's actions may or may not have contributed in the change of plans. * The Corps has a developed a "How To" manual for reworking the Interim Closure Structure (ICS) into a permanent facility. The price tag on ripping out the M.W.I. pumps and replacing them with direct drives is approximately $275 million dollars. According to Ms. Garzino, the original estimate that the Corps submitted to Congress included a 50-year design life for the ICS. Spending $275 million after you told Congress that what you built had a 50-year design life is a waste of money. It's not completely an apples-to-apples comparison, but I think it's still useful to mention that large offshore oil structures have a design life of 35 years. I listened to the radio interview to make some sort of judgment on Ms. Garzino's credibility. I listened like a hawk and took notes and while there were some contradictory statements, her interview taken as a whole leaves me to conclude her story is quite credible. All of her major assertions check out. * The Corps really moved the chains for M.W.I. to pass the tests. Some of the moves were no big deal, but others were not legitimate. When competitively bidding contracts, you have to hold the winning bidders to what they said they'd do, especially with regards to testing. It violates ethical engineering practices and its unfair to the losing bidder. I understand the Corps' complaint (that they were under the gun for time), but the Corps is not the first entity in the world to face a looming deadline for a major, complicated project. If the Corps asked for testing the pumps, M.W.I. should have had a line item of a few thousand per pump for testing. If they didn't and they won the bid because of that, they should be forced to eat the difference. Remember, there's hardly ever only one vendor that can provide a piece of equipment or service. * Verifying the pumps against their curve (making sure they work as the salesmen claim) is an important step. Hydraulic Institute standards state no worse than +/- 5% of the curve. Hydraulic Institute standards are MINIMAL; I can tell you that most clients I've dealt with have much more stringent standards on the pumps they test. If it's just a $50,000 pump or so, you're probably not going to bother testing it. Millions of dollars worth of pumps? You're going to get them tested. For critical systems, like de-ballast, firewater, etc. you're going to test the pumps to the Nth degree with a good chance of additional factory inspections. * M.W.I. 's salesmen may have made excessive claims, but its the duty of the engineers not to just take them at their word and verify what they say. I worked on a job about a year ago where an engineering company bought some pipe for a pump discharge that wasn't pressure rated. I talked with the engineer and he said the salesmen said it was "an ideal application." I talked with the salesmen and he he told me it meets certain AASHTO, etc. specifications. I looked up those specs and the first thing they say is that these standards are meant for non-pressure rated pipe. The ratings the specs give were minimal 20 foot of head (~10 psig) ratings that should never have led an engineer to use them as force-mains. It's the engineer's job to run these things down. For one example of what Louisiana COULD be, if we had effective political leadership, look to Norway. Norway's oil-fueled socialist government was recently reelected. The margin was thin, but its first time a government is reelected in years. The Norwegians have figured out that politicians are like diapers and should be changed often for exactly the same reason. Norway is an extremely advanced country built up by strong social values (which go back to having to prepare as a group for fierce winters) and a robust oil industry. Oil is almost always a curse, when it comes to economic development. One of the terms commonly used is Dutch Disease, where oil riches cause all other sectors of the economy to shrivel. In Norway, the oil industry has helped out a lot of other industries. Most of the early multiphase flowmeters were developed in Norway. Their shipbuilding industry, which also benefits from terrific natural harbors (fjords), is so big that a lot of the hulls for platforms in the Gulf of Mexico are built in Norway and transported to the US, despite higher labor costs and transportation costs. Another way Norway was saved by the curse of oil? The fortuitous arrival of an Iraqi: The man who saved Norway. He pushed for a balance between resource nationalism and outright capitalist exploitation that would lead the people getting less than full value for their natural resources. ... if you rely too much on private foreign companies, too little of the oil wealth benefits the country in the form of government revenue or economic development; if you go too far in the other direction, you risk a bloated, politicised oil sector that evades both accountability to the people and competitive pressures to be efficient. Also, instead of squandering oil wealth or it disappearing into the pockets of politicians, almost all the revenues go into the Government Pension Fund of Norway, which hoards most of the wealth for when the one-time endowment of oil is depleted. Norway Thrives by Going Against the Tide - NY Times. This country beats France: Norway. One thing that I forgot to include on this post that I found pretty interesting was "Kelly Johnson's 14 Rules of Engineering Management." In general: "Be quick, be quiet, and be on time." Note that Kelly had a 15th rule that he passed on by word of mouth. According to the book "Skunk Works" the 15th rule is: "Starve before doing business with the damned Navy. They don't know what the hell they want and will drive you up a wall before they break either your heart or a more exposed part of your anatomy." Corps revises London Ave. Outfall Canal ICS operating procedures. The big news is that the safe water level has now been reduced so low (about 2.5 feet) that the pumps will now run during all major rainfall events. The interim setup, even if every single pump operates flawlessly to its full design capacity, is only designed for a 10-year (UPDATE- "rain") event. We've heard many times how much of a joke the 100-year level is. The 10-year level is even weanier. Pumping Station #6, which feeds the 17th Street Canal and is the main pumping station for the city of New Orleans, is capable of putting out a little over 10,000 cfs. That's an admitted shortfall of over 20% at that pumping station. In a big enough storm, water will begin to back up. In a short/lightish storm, the only thing that will probably happen is street flooding and maybe a few flooded cars. In a long-lasting/high-intensity storm, large parts of the city , especially Gentilly (drained by PS#3 & #4), Mid-City and Lakeview, will flood. The parts of the floodwalls that failed were repaired quite thoroughly. The Corps rebuilt those parts with T-walls with ample foundations. But, the parts that didn't fail were left untouched. There's been a about what the safe water level for the Canals is. Each time the Corps has investigated, the walls have been derated. The walls SHOULD be rated to their top (a little over 10' elevation). Instead, they've been derated, especially on the London Avenue Canal, where they'll now close it at 2.5'**. There are currently no plans whatsoever to rebuild the walls or repair them in any way. The Corps says it would take too long and would take too much money and they'd rather get the permanent pump stations online. 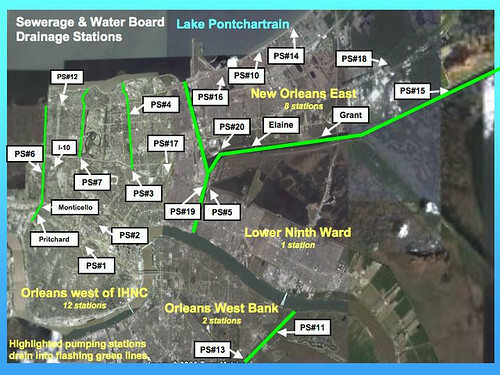 If you were to sit the major engineering experts in the area down and ask them what the 3 most important projects are for New Orleans, I'll bet the lion's share would include the permanent pump stations at the mouths of the outfall canals. When the "10-year storm" standard was adopted (~ early 2006), the Corps was planning on having the permanent pump stations in place no later than 2010. Had they been replaced then, the 10-year storm standard may have been reasonable. Now, they're officially saying it will be complete by 2012, at the earliest. The Corps has picked up the pace, but it's looking more like it will be 2013 at the earliest before the stations are complete. The longer it takes for the permanent pump stations to be built, the more maintenance will be required and the more one should question the original design basis for the pumps. Bottom line: The pumping capacity of the City of New Orleans is seriously constrained. Sections of the city, especially Gentilly, Lakeview, and Treme/7th Ward, WILL flood in storms significantly less intense than the minimal 100-year level we expect, even without a levee breach. The extent of the flooding will be proportional to the storm intensity and duration. The system will not be fixed for several years at the current rate. Major weakpoints in the system (the weakened walls) will still not be fixed by the time the system is complete. I hope that sums things up without droning into too much detail. * I'll leave the "contractual" issues for others to comment on, I'll stick with my expertise. From what I understand, the Corps basically called around to see who could supply the most cubic feet per second (cfs) by next hurricane season. That particular time, because of rising commodity prices, was a bad time to be buying heavy equipment, especially pumps, especially pumps that large. I'll give the Corps the benefit of the doubt and say that, among those they contacted, MWI had the most cfs with the quickest stated delivery. ** Safe water level used to be about 5' with closure at 4'. Now it's 4' with closure at 2.5'. The Corps has said they will take whatever measures necessary to stop the level from rising in that Canal, including shutting off all pumps feeding the canal until their pumps can catch up. It's already happened several times. The canal walls have been derated so much, I'd curious how they justified the decision to give them any rating whatsoever. PS- Thanks again, Matt McBride. Fix the Pumps is a great reference site. NOTE: Some minor edits after initial post. UPDATE 2- London Avenue floodgate closes today (9/12) due to heavy rainfall. If you were to list the most important Aerospace Engineers of the 20th Century, your list would have to include Clarence "Kelly" Johnson. He designed the P-38 Lightning, the P-80, the U-2, the A-12/SR-71 Blackbird, the C-130, among many others. His right hand man/successor wrote a history of the the Skunk Works, Lockheed's independent wing that develops secret aircraft. William Perry, one of Clinton's SecDef's, as the best SecDef in modern US history. * F-16: great, but low fuel capacity. * F-111: Overly complicated. Huge EM emissions made it a magnet for missiles. Only was built because its factory was in LBJ's hometown. * B-70. Obsolete even in its early years of development. Should have been canceled way earlier than it was. As interesting as the book was, I was only going to give it three stars, but then I read the last chapter. It's filled with tips on successful project management and his vision of the future (from 1995-ish). It includes lots of drones like the Preadator, bashes the B-2 and F-22 for deliberately spreading out contracts, to the detriment of the budget, to make the planes "cancellation proof" in Congress, and emphasizes the importance of a strong US industrial base. He doesn't talk about machines and facilities when he means industry; he's talking about welders, machinists and engineers. I spent a little while reading through reports about BP's Tiber strike and I found one little nugget that caught my attention: US Yearly Production Increases for the first time since 1991. 150 Years Ago, Col. Drake drilled a hole in the ground. For a long time after that, The US was the 'Saudi Arabia' of world oil production. US production underpinned the Allied War machine in WWII, but shortly thereafter, we started to import oil. The US was still mostly independent, but in 1970, US oil production peaked at 12.5 Million Barrels/Day and began to slowly decline. In the early 90's, we started importing more oil than we produced. Even with the giant fields of Prudhoe Bay and the Gulf of Mexico, US production continued to fall because of depleting older oil fields, like Texas, Pennsylvania, and California. Reversing that trend, even if it will only be in the short term, would have dividends for US energy security. Maybe we will be more reluctant to send so many young men and women to die in a hot desert on the other side of the globe for black goopy stuff (not to mention the incredible financial cost). 20 years ago, consensus amongst geologists was that the Gulf of Mexico was a "Dead Sea" when it came to any future oil production. A lot of oil production happened up until the continental shelf and a few deepwater fields were built, most notably Shell Cognac and then there was a long lull. After Cognac, almost nothing new was built in the Gulf until the early/mid-90's. From the late 70's/early 80's all the way through the early/mid 90's, Gulf exploration and production floundered. Scores of local service companies went under. But, for now at least, it looks like the good times are back. I noticed one other thing about the Times-Pic article was almost all of their quotes came from Service Companies. Almost everything that's done in the oil industry is actually done by service companies. Once the geologists find the oil and the platform is built (by a third party shipyard with subcontracting engineers, like yours truly helping out on the design work), only about 10-20% of the personnel offshore are for the actual oil company. 40-50% of the crew is for the drilling company. Another 10% are for catering. The rest is split between a multitude of specialties, from chemical vendors to construction workers, etc. For every person employed with the major oil companies, there's at least 10 people involved in the service companies. Tiber, and all the other Lower Tertiary Trend Fields (I'll get to that in a sec) will be supported out of Port Fourchon. Even if the majors move their main offices to Houston or the Northshore, that means tons of jobs for South Louisiana. The Lower Tertiary Trend is a large area that is believe to hold the key to the future of oil production in the Gulf of Mexico. Jack, St. Malo, Kaskida, Cascade, Chinook, and Tiber are all a part of this area. Out of all those prospects, discovered over the past decade, only three are close to producting. Many companies are sitting on their hands either because of technical reasons or economic reasons. It could be quite a while before we see even a single barrel of oil flow out of Tiber. The Oil Drum has a fantastic wrap-up written after the Jack #2 strike years ago. Chinook and Cascade will produce 80,000 barrels/day out of the first Floating Production, Storage and Offloading vessel (FPSO) in the Gulf of Mexico. First oil is slated for sometime early next year. The other field is Perdido, slated to come on line any day now at 130,000 barrels/day. Perdido is a "spar"-type platform. What the video doesn't really convey is the SCALE! 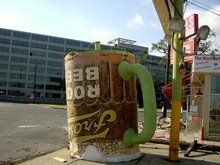 If you put the base of that spar on Poydras street, the bottom of the topsides (living quarters/production equipment/etc.) would be a little shorter than One Shell Square (50+ stories). With the topsides and drilling module (about the size of a 10-story building), the Perdido Spar would dwarf every single building on the skyline. Here are some incredible photos of the Perdido topsides being lifted into place. Look at the size of some of the oil workers in scale with the enormous hooks and cranes and equipment. One of the big battle to be waged in the Lower Tertiary Trend is FPSO vs. Spar. The Coast Guard has, for various reasons, frowned on FPSO's in the Gulf. They've allowed Cascade/Chinook as a test. Spars are a more proven, very reliable design that depends on the sheer bulk of the platform to absorb the weather. FPSO's are much more delicate, but the oil companies like them because they're cheaper to produce and man. Part of Petrobras' pitch with their FPSO was they'd drop their umbilicals and risers and run for the hills when a hurricane approaches. We'll see how that works out. Also, FPSO's don't have pipelines leading to shore. They store about 1 million barrels of oil, roughly the size of a supertanker, in their hull. Shuttle tankers tie up alongside the FPSO and offload crude to run to shore. Those shuttle tankers go back and forth with all the crude that is produced in lieu of a pipeline. Will the Coast Guard allow a dozen or more FPSO's, with all of their associated shuttle tankers, to operate in a very crowded Gulf of Mexico with two of the largest ports in the world (New Orleans and Houston) also in close proximity? Will that be the only economical way to develop the oil? The Times-Picayune cover story today was all about BP's massive strike at the Tiber Prospect. The article, all and all, was pretty good. I've got a few things to add to it. BUT, (and there's always one of those hanging around out there) there has only been one appraisal well sunk so far. Until a second "step out" well is drilled, the estimates are just that: estimates. The other thing to consider is how "reserves" have changed over the years. Right now, they're talking about 1/3 to 2/3 of the oil "preliminarily technically recoverable." Of that, they're not saying, but it seems that half that is economically feasible (we'll see about that). The fact that they're talking about this at all is surprising. Until recently, the SEC monitored all statements about new fields. Throwing out huge numbers like this based off a single well would draw their ire, possibly resulting in fines. "Reserves" are what oil companies live off of. "Reserves" fall into two major categories: Proven and Possible. For oil to be considered "Proven", several test wells (generally at least 2-3) have to be drilled at specific intervals and flow tested for a specific duration. Up until very recently, "Proven" reserves were (generally) VERY, VERY conservative calculations. Now, the SEC has relaxed their rules. How much they have they relaxed? There's not enough data to really say. Some of the changes were probably good (for example, allowing unconventional oil, a la Oil Sands to be booked with the rest of the reserves instead of a separate category), while it remains to be seen how the rest will play out. On the other hand, there are always risks in the oil business. For example, one large field in Yemen was waterflooded (an enhanced oil recovery method) a little too aggressively and entire field collapsed. For another example, look at the ironically-named Typhoon TLP. Most people in the oil business could scale up the conservative "proven" oil to come up with a pretty accurate guess as to how much the field will really produce. To give you an idea of what I mean, the largest platform (by production) in the Gulf is still(? )/was until very recently* Mars. It's peak production was 220,000 barrels a day. It was originally only allowed to book about 350 Million Barrels as "proven." It's produced much more than that in the 13 years since first oil. My best guess is that the new system will lead to a more accurate overall picture of the reserves, but for individual field analysis, Caveat Emptor. The real test of Tiber will be when the second well is drilled. Will the Times-Picayune still put it on the front page? NOTE: I've decided to break up this post for ease of reading. I've tried to make this post as informative as possible, but I'm drawing from a broad range of topics within the oil industry. If there's a mistake, please let me know. * Mars set the record at 220,000 barrels/day. Thunderhorse will produce at 250,000 barrels/day when all wells are online. Thunderhorse had first oil in December of last year. I don't know how far along they are in bringing on production, hence the hedging.